Juvenile rheumatoid arthritis (JRA), also known as juvenile idiopathic arthritis (JIA), is a chronic inflammatory disease that primarily affects the synovium of the joints resulting in effusion and eventual erosion and destruction of the joint cartilage. JRA is categorized into different classification and manifested by remissions and exacerbations with the onset usually occurs between ages 2 to 5 and 9 to 12 years old. Pauciarticular arthritis is the most common form of JRA that involves 4 or fewer joints; polyarticular arthritis involves many joints, usually more than four. Systemic arthritis involves the presence of joints swelling, and associated fever, light-pink rash, and affect internal organs such as the heart, lungs, eyes, liver, spleen, and lymph nodes. Prognosis is based on the type of arthritis, the severity of the disease, and response to treatment with the most severe complications of permanent deformity, hip disease, and iridocyclitis with visual loss. 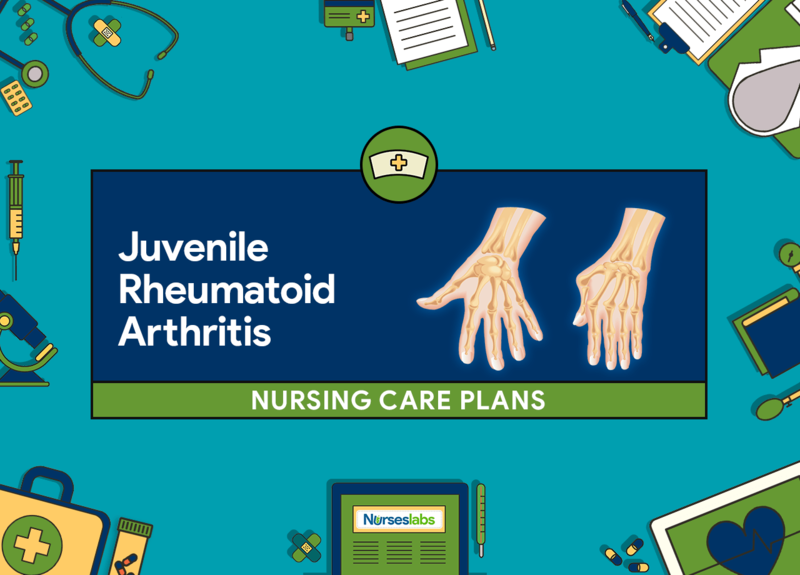 Nursing care planning goals for a child with juvenile rheumatoid arthritis aims to provide relief of pain, improve coping ability, preserve muscle and joint function, prevent joint deformity, promote positive body image, and increase confidence in the performance of self-care activities. Chronic Pain: Unpleasant sensory and emotional experience arising from actual or potential tissue damage or described in terms of such damage (International Association for the Study of Pain); sudden or slow onset of any intensity from mild to severe, constant or recurring without an anticipated or predictable end and a duration of greater than 6 months. Child will report that pain has reduced using a pain scale. Assess joint pain including its location, duration, severity, remissions and exacerbations, stiffness and aggravating factors such as weight gain, activity, fatigue; effect on mobility and participation in ADL; presence of joint deformity. Reveals symptomatic of the effect of the disease on the musculoskeletal system: guides for the selection of analgesia/anti-inflammatory medication and better management of activity involvement; inflammatory process causes pain while limited motion resulting from muscle spasms, joint effusion, synovial thickening results in edema; joint destruction causes joint deformity. low effective dose corticosteroids are administered for a short period of time particularly during a life-threatening situation. of comfort; elevate and support painful joints during positional changes. Detracts pain through diversionary activities. Apply warm application or moist heating pads to painful areas; paraffin baths and whirlpool as ordered. Provides the area with circulation through vasodilation to ease pain; moist heat soothes painful, stiff joints. Apply splint as ordered for night use. Immobilizes inflamed joints to relieve pain during movement. Provide adequate rest periods during the day and quiet environment for sleep. Lessens stimulation that increases pain, and it promotes rest, especially during acute episodes. Explain to the child about causes of pain and interventions to take in relieving the pain. Provides understanding on the treatments and medications. Educate child and parents about factors (stress, climate movement) that heighten pain episodes, and to express or report the presence of pain at the onset. Promotes an opportunity to prevent those situations or activities that contribute to pain exacerbations and to provide for quick relief. overactivity or movement of affected joints. Avoids injury to affected joints during the acute episode when immobilization is important. Teach parents to provide a warm bath daily for 10 minutes or warm wet packs with a towel bath to painful areas. Supplies heat to affected joints to relieve pain and stiffness. Encourage and teach the child with relaxation techniques such as music, arts, reading, television. Provides nonpharmacologic measures to relieve pain. Instruct parents and child in the proper administration of medications including side effects and importance of compliance with the regimen. Promotes compliance with the medical regimen to manage pain and inflammation.